Diffuse large B cell lymphoma (DLBCL) is one of the most common types of malignancy worldwide. The lack of clear symptoms and early detection make it difficult to diagnose at an early stage, leading to poor prognosis of the patients. Long non‑coding RNAs (lncRNAs) have come into focus for their important regulatory roles in fundamental biological processes, particularly in cancer initiation, development and progression. 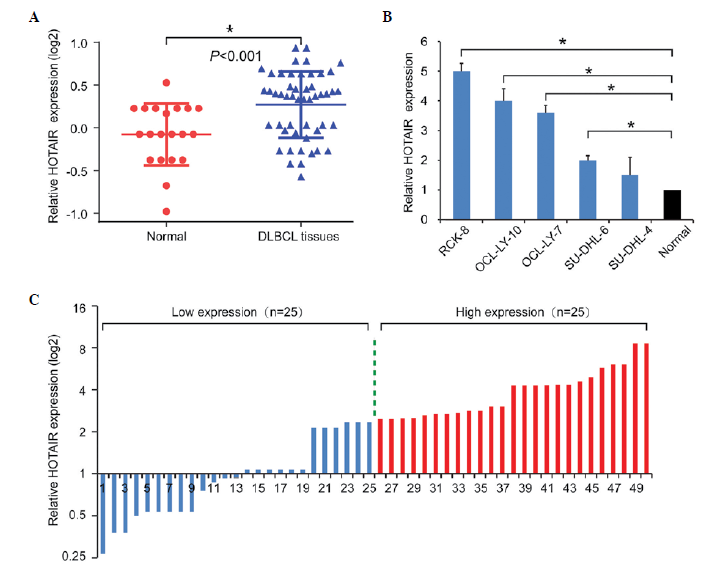 Researchers at Dongying People’s Hospital investigated the expression of lncRNA Hox transcript antisense intergenic RNA (HOTAIR) in a cohort of patients with DLBCL to assess its clinical value and biological function in DLBCL. The reverse transcription‑polymerase chain reaction was used to detect HOTAIR expression levels and cells were transfected with small interfering RNA to compare cell proliferation, cell cycle progression and apoptosis. Western blotting was also conducted to detect possible signaling pathways. It was first found that the expression levels of HOTAIR were upregulated in DLBCL tumor tissues and cell lines, compared with normal tissues and cells. In addition, HOTAIR was significantly correlated with tumor size, clinical stage, B symptoms and International Prognostic Index scores; and higher expression levels of HOTAIR were correlated with improved prognosis. Univariate and multivariate analyses verified that HOTAIR was a key independent predictive factor for DLBCL prognosis. Furthermore, it was revealed that the knockdown of the expression of HOTAIR led to growth inhibition, cell cycle arrest and apoptosis in vitro, possibly through the phosphoinositide 3‑kinase/AKT/nuclear factor‑κB pathway. These results suggested that HOTAIR may be regarded as a novel indicator of poor prognosis, and may serve as a potential target for gene therapy in the treatment of DLBCL. (A) Expression levels of HOTAIR were significantly upregulated in the cancer tissues, compared with the normal tissues. (B) Expression levels of HOTAIR were significantly upregulated in the DLBCL cell lines, compared with the normal group. (C) Expression of HOTAIR was classified into two groups (low and high). Data are presented as the mean ± standard deviation from three replicate samples. *P<0.05. HOTAIR, Hox transcript antisense intergenic RNA; DLBCL, diffuse large B cell lymphoma.